My husband and I don’t really go out on traditional “dates.” We’ve never really had the money to spend on activities. Instead, we’ve been content to stay at home and watch a movie (Netflix is cheap!) or play board games. 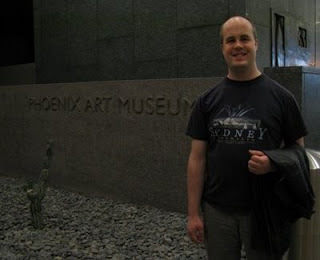 While driving to work one day, hubby noticed the Phoenix Art Museum. I went online to find out how much admission costs and discovered they have free admission every Tuesday evening! Date night! Two Tuesdays ago, we drove over to the Museum. Sure enough, there was free admission for the general public. We spent a little over two hours wandering through the exhibits. We quickly walked around the 43rd Annual Cowboy Artists of America Exhibit. Some of those paintings had absolutely gorgeous skies! 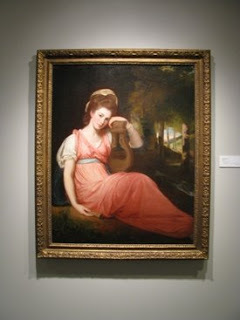 The display said that it was a George Romney painting titled Anne Birch. Unfortunately, I couldn’t find any information on the internet about this particular painting. We’re planning on visit the Art Museum next month for this exhibit. Not only is the museum free on Tuesdays, but it’s a creative, mind stimulating, and fun date. Now I’m on the lookout for other places that have free admission!